Super Lucky Frog is a fantasy slot that has 3 progressive jackpots. It’s a NetEnt creation that is based on fairy folklore and features some manga-inspired artwork to give the game a unique look. This slot has nice graphics with a pleasant vibe and the gameplay provides genuine excitement. Before you play slots online, it’s always a good idea to take a moment and learn how the game works. Click ‘Paytable’ beneath the bottom left reel to see the mappings for each bet line, values for each prize symbol and instructions for each of the special features. Of the standard symbols, the unicorn and green pixie share the highest value of 500 coins (bet level 1) for 5 in a row on any active bet line bet line. However, only two symbols are needed to get a return with the unicorn, whereas the remainder of the standard symbols require 3 or more to make a winning combination. Bet line wins pay if in succession from leftmost to right. Wilds are denoted by an elf holding a bow and arrow. Wild symbols substitute for all other symbols apart from scatter symbols and do not qualify for the jackpot. Get 5 wilds on an active bet line for a 7,500 coin payout based on bet level 1. Scatter symbols are represented by a fairy and do not need to be on the same bet line. Get 2 or more scatters anywhere on the reels for a multiplier of your bet for that spin, up to 400x for 5 scatters. 3 scatters will unlock 10 free spins, 4 scatters will get you 20 free spins and 5 scatters is worth the maximum 30 free spins. Wins in free spins are given a 3x multiplier and you can win additional free spins by spinning in more scatter symbols. The bonus symbol is a winged frog wearing a crown. Get 3 or more frogs on an active bet line to initiate the bonus jackpot game. The bonus game is very much in the same ilk as wheel of fortune, whereby you must spin a wheel to win a prize. You’ll either win the coin value displayed in the top-right or one of the three tiers of jackpot; Froggy, Lucky and Super. It’s really easy to set up the game and you’ll be spinning the reels in no time. Start by clicking ‘Bet Lines’ to activate as many bet lines as you wish to play, noting the path that each one takes across the reels. Then set your ‘Bet Level’ which determines the number of coins placed on each active bet line. Finally, select your ‘Coin Value’, remembering that the overall cost per spin will also be affected by the number of bet lines and coin value. For example, with all bet lines active, a coin value of 0.02 at bet level 2 will cost 1.00 per spin (0.02 x 2 = 4 x 25 bet lines = 1.00). The ‘Max Bet’ button will automatically set the bet lines to 25 and bet level to 4 before initiating a spin, so remember to set your coin level first as the cost per spin will be 100 times the coin value displayed. You can alter a few in game settings to suit your personal taste via the four icons at the bottom of the screen. The spanner allows you to toggle the use of ambient sound and sound effects while the overall volume is controlled with the speaker icon. The question mark opens the help menu and the Auto but allows you to customise the autospin feature. To begin playing Super Lucky Frog video slot, either use the autospin feature or click the green circle with white arrows. You can click the spin button again while the reels are still spinning to execute a skill stop. Super Lucky Frog online slot is not an easy game to find but can be played at Redbet Casino, Reel Island and Mr Green. It is not available on mobile and you won’t see it featured in any welcome packages. You can win a life-changing amount of money on this game, though not in the region of Mega Jackpot games and some other progressives. The base-game is easygoing and offers plenty of low-level prizes but the return to player (RTP) is not great. With this in mind, Super Lucky Frog can feasibly be used to try and beat the wagering requirements of a casino bonus with the outside chance of winning a big prize, though other NetEnt slots such as Bloodsuckers or SimSalaBim are best for beating bonuses. The fact that only 2 unicorns, scatters or wilds are needed to get a return does help to keep the low-key wins flowing. In the base game, getting 5 wilds is your best chance of a good win at 7,500 coins at bet level 1. However, the free spins game offers triple wins, so this could become 22,500 coins if your luck is in. The bonus feature is surprisingly active and you’ll at least win back the cost of a spin, even if you don’t win the jackpot. 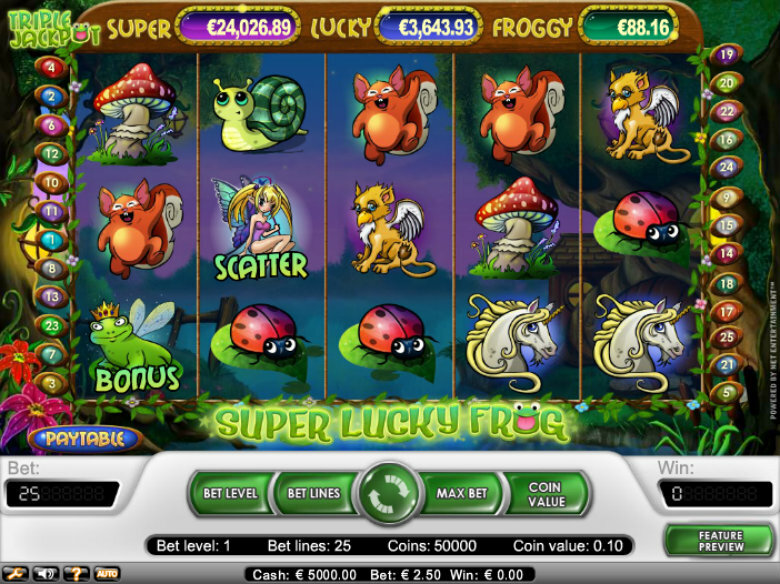 Is Super Lucky Frog The Right Slot For You? Super Lucky Frog slot is a low variance game with the added bonus of being able to win a considerably large prize. As the jackpots are made up of bets on the game across a series of casinos, it’s little surprise that the RTP is quite low for an online slot at 93%. This gives the casino a house edge of 7% which is bigger than most slots. Still, because this game offers regular small wins, you can enjoy a good play-session with the outside chance of scooping a sizable jackpot. Although there is no quick-spin feature, gameplay is remarkably brisk and you can get through a fair few spins in next to no time. Animations are subtle and short-lived, so there is little interruption to your flow. The bonus game, while exciting, only takes a matter of seconds to play out and you’ll be able to carry on spinning right away. This game does not have the quality graphics of other NetEnt slots like Jack and the Beanstalk but is very much in the same kind of genre. It offers light and lively entertainment from a low cost with every chance of striking it rich in an instant.